A year ago, we did something that seemed like an impossible goal – we opened 154 new rental locations. A year ago, we did something that seemed like an impossible goal – we opened 154 new rental locations. This was also our first full year of roll-out of our alliance with Harley-Davidson Motor Company to grow ridership and make rentals more convenient and widely available nation-wide. Our teams worked around the clock to ensure a seamless experience as we expand and reach this new milestone. 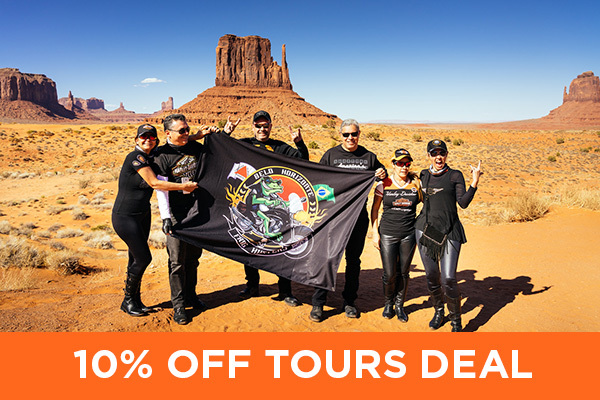 So, as we enter 2019 riding season, we wanted to share more exciting updates that you should keep in mind when planning your rides and trips: new rental models, new locations, address changes, tour route updates, and two exciting updates from Italy, our latest H.O.G. deals, and two new travel products. First off, let’s chat about the new bikes. 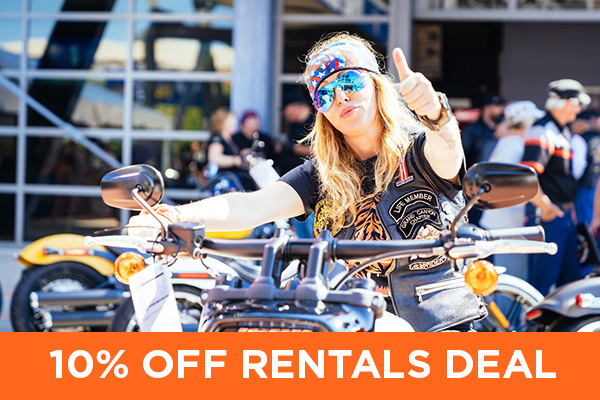 As many of you know, we made a major change to our rental fleet and each year you get to ride the current or past model year motorcycles. This means that when you arrive for your trip, the motorcycle may have less than a few hundred miles on it – pretty much brand new. You’ll get to experience the latest advancements in frames, engines, technology, handing, and much more. If you’re trying a bike out before the purchase, this is a great way to see how this exact motorcycle may really be the one you’ll take home from a dealer. This year so far, we have 43 new locations opening in the United States. Please note the locations and the earliest dates they’re available for rental pickup. We will continue updating this list on this page as the year goes on. Let’s just say this is not a complete list and there will be more exciting additions to our network of locations. We’ve moved to several new locations in Denver. Please note the address changes below. Our team in Denver will reach out to everyone with existing reservations and will guide you to the proper location for your pickup. All existing Harley-Davidson model reservations will be executed out of Mile High Harley-Davidson at our Denver Main location and all BMW and Triumph reservations will be executed out of Foothills BMW & Triumph at our new Denver BMW & Triumph location. Please note the address changes below. 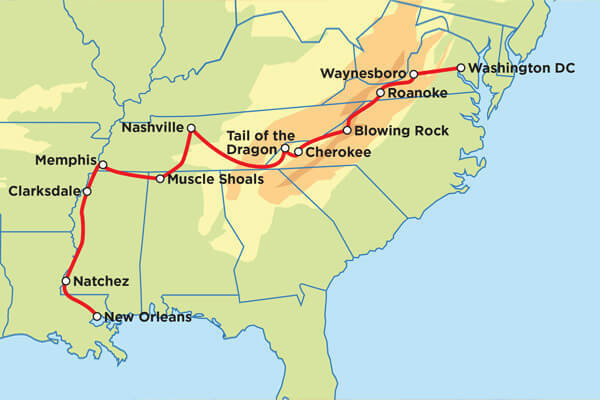 Triple B - Blue Ridge, Blues, and BBQ - Motorcycle Tour – we revamped the route completely and the tour now starts in Washington DC, goes through breathtaking Blue Ridge Parkway and Tail of the Dragon (considered among the best 5 motorcycle roads in the US), continues through the hometowns of country music – Memphis and Nashville, and ends in New Orleans in the heart of the French Quarter. 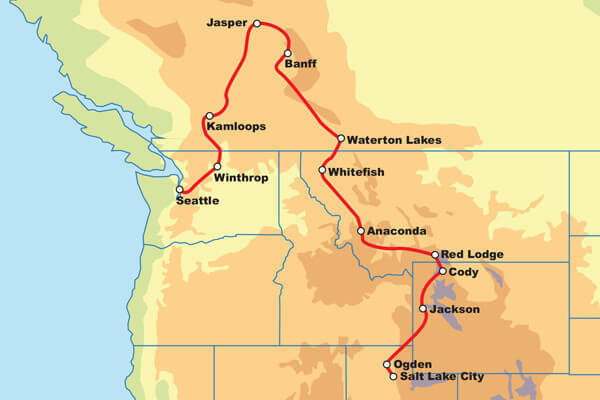 Canada to Yellowstone Motorcycle Tour – now ends in Salt Lake City instead of Denver. We also added an additional day in Yellowstone NP, Wyoming to let you soak in the Western motives and amazing views all around. Ride a full loop around the park, which offers a diversity of elevations and landscape changes from geisers to valleys full of Buffalo and alpine rivers. A quick note on our new series of winter tours that launched in the fall of 2018 – these 5-day adventures are a great way to spend an extended weekend riding in warm weather destinations while there is snow outside your front porch. If you want to learn more about the winter tours, take a look at a more detailed guide to winter riding. After a successful launch of our first location in Milan two years ago, our Italian team is excited to branch out and add a second rental location, this time in Rome! Just when you thought a trip to Italy could not get any more tempting, we’re sweetening the deal with EagleRider Rome set to open April 1, 2019. 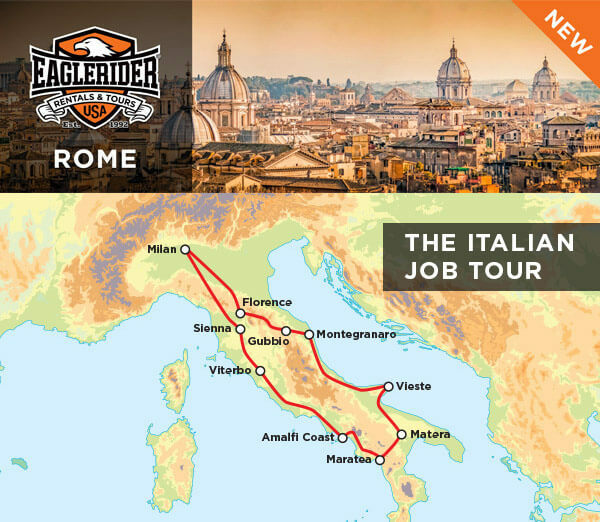 Our team worked together with our Italian-native tour guides and put together an amazing route, now available as a Guided tour called The Italian Job. This 15-day adventure will take you from EagleRider Milan location down to the heart of Italy and back: from Tuscany region with famous hills of the Chianti wine region, Siena, Amalfi Coast, Maratea, Matera, famous for its sassy and stunning landscapes, Vieste, a southern marine resort, Umbria, region known as Italy's Green Heart, again Tuscany region with Florence, a dream place to visit for millions of people, and back to Milan. We recently finalized out H.O.G. specials for 2019. Please see deal details for more information. We hope this token of our appreciation will open up more travel possibilities, longer trips, new rides with friends, and a quality time on the road. This year we're also introducing two new ways to make your riding eperiences more comfortable. 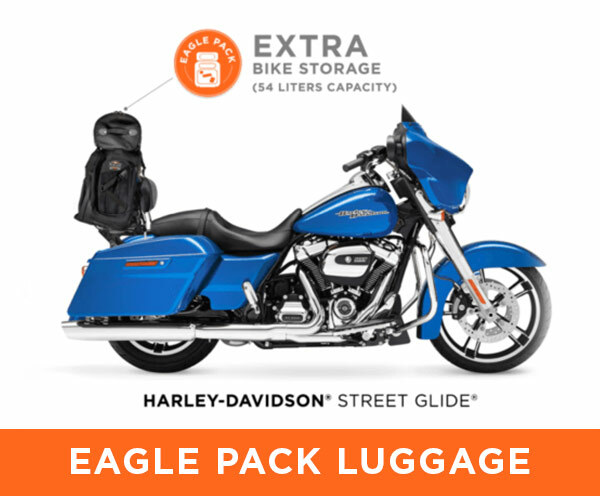 We added an option to purchase a luggage storage "Eagle Pack" for motorcycles without the touring pack. And by popular demand, we added a special option available for any rentals or self-drive tours to add a support van with a bi-lingual driver. 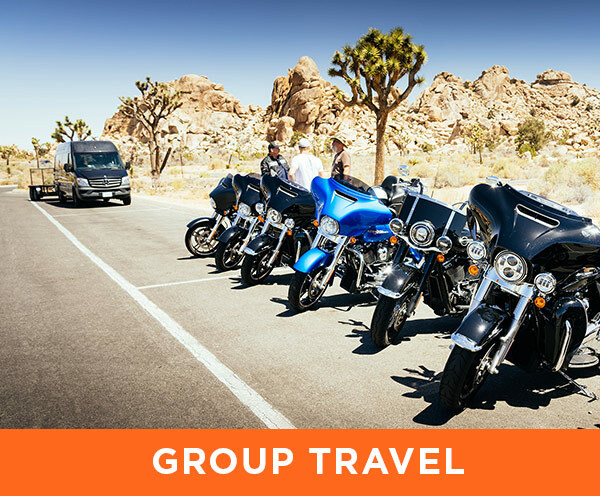 For groups of 5 or more bikes, this is a great way to have the flexibility of a rental with the comfort and convenience of a guided tour. Please click below to read more about each of these two new exciting products. We hope you enjoyed reading this overview of what's new with EagleRider for 2019. We look forward to making your dreams rides turn into reality. Let's do it together!